Israeli deputy premier and defense minister says President Bashar al-Assad’s forces currently hold only 40 percent of Syria’s territory and have lost their grip on four neighborhoods in the capital Damascus. He said Iran’s Lebanese militia Hezbollah is moving “its best troops” into combat in Syria, which has become a battleground between Shiites and Sunnis with each side "massacring the other." What Israel does not want to see, he said, includes the transfer of advanced weapons, missiles, or chemical weapons from the Damascus government to Hezbollah or a heating up of the frontier and a spillover. Yaalon confirmed Israel is operating a field hospital on the Syrian border and transferring severely wounded Syrian nationals to Israeli hospitals for treatment. In Washington, Secretary of State John Kerry said on Monday the United States came "late" to efforts to end the war in Syria and is trying to prevent the total collapse of the country. "This is a very difficult process, which we come to late," Kerry said at a news conference, speaking of a U.S.-Russian effort to bring the warring parties to a peace conference, known as Geneva-2, which might lead to a transitional government. The State Department’s spokeswoman, Jennifer R. Psaki, said Kerry’s remarks had not been intended as a rebuke of the administration’s policy thus far. “It’s not an implied criticism of anyone — more just a recognition that more needs to be done and that’s what we’re focused on,” she said. Kerry said he spoke with his Russian counterpart on Friday and Sergei Lavrov is "deeply committed" to supporting the conference, but added the situation in Qusayr "could put this kind of thing at risk." The members of the Security Council express their grave concern about the situation in Qusayr, Syria, and in particular the impact on civilians of the ongoing fighting. The members of the Security Council strongly call upon all sides to do their utmost to avoid civilian casualties and for the Syrian Government to exercise its responsibility to protect civilians. They emphasize that those responsible for atrocities or other violations or abuses of applicable international law will be held accountable. The members of the Security Council call upon the Syrian Government to allow immediate, full and unimpeded access to impartial humanitarian actors, including UN agencies, to reach civilians trapped in Qusayr. …With respect to the Turks and the process for Syria, let me just begin by saying that what is happening in Syria is happening because one man, who has been in power with his family for years now, more than 40 years, will not consent to an appropriate process by which the people of Syria can protect minorities, be inclusive, and have the people of Syria decide their future. He has decided to protect himself and his regime’s interests by reaching out across state lines and actually soliciting the help of Iran on the ground with foreign fighters as well as Hezbollah, a terrorist organization. A designated terrorist organization has now crossed over from Lebanon into Syria and is actively engaged in the fighting. President Assad is not unwilling to use Scuds against women and children and students and doctors and hospitals. He’s not unwilling to wreak havoc on individual citizens. And today in Qusayr, which is under siege by his forces and the surrogate forces, you have an extraordinary number of civilians who are trapped, and he will not allow the Red Cross and humanitarian aid to go in until the military has finished what it intends to do. So I think the world is seeing the actions of a person who has lost touch with any reality except his own and who is willing to wreak any kind of punishment on his own – on the people of his country simply so that he can maintain power. And so this situation is obviously intolerable, unacceptable by any standard, and I think all civilized countries would call on the Assad regime to pull back from that and to engage in a legitimate peace process. Now, with respect to that, I’m confident that Turkey will continue to be a critical player in this. I’m confident Turkey will reach out and resolve these questions. It’s not the first time any government has faced this kind of challenge. And I do expect Foreign Minister Davutoglu and the Prime Minister (Erdogan) to remain engaged in the effort to try to resolve what is happening in Syria. With respect to Geneva-2, we all understand – I have said from day one – this is a very difficult process, which we come to late. We are trying to prevent the sectarian violence from dragging Syria down into a complete and total implosion, where it has broken up into enclaves and the institutions of the state have been destroyed, with God knows how many additional refugees and how many innocent people killed. That’s why the effort to try to have an implementation of Geneva 1 take place at a conference. Now, when that ripens, when that becomes a reality is going to be decided by events on the ground and the participants themselves. The United States can push and cajole, and President Obama has instructed all of us to try to take every step possible to protect the people and to provide a venue for this dialogue to take place. But in the end, the people on the ground are going to have to decide that that’s something they’re prepared to engage in. I spoke with Foreign Minister Lavrov on Friday. We had a good conversation. He remains deeply committed to trying to make this conference happen, as do all of the support group of the people involved with the opposition. But I will say that the possibility of the transfer of S-300s, which will upset the balance of power with Israel as well as the prosecution of this lopsided military initiative in Qusayr and the trapping of civilians and the treatment of civilians, could put this kind of thing at risk. So we hope people will pull back and stay focused on the possibilities of implementing Geneva 1 and having a legitimate conference. 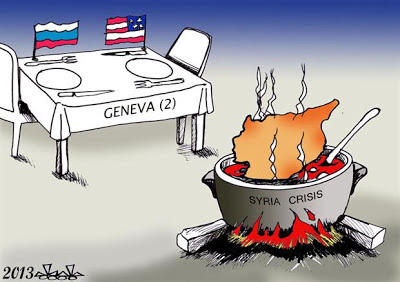 This week – tomorrow, in fact – Under Secretary Wendy Sherman will travel to Geneva. She will meet with Russian counterparts, and we will continue to lay the groundwork for the possibility of a negotiated resolution. And we will stay committed to that possibility notwithstanding the violence on the ground and the difficulties that we face. Labels: Assad, Damascus, Geneva-2, Hezbollah, Iran, Israel, Kerry, Lavrov, Moshe Yaalon, Qusayr, Russia, Syria, Syrian opposition, U.S.